Good news! Our congregation recently voted to call Jeremiah Fair as our lead pastor, and Jeremiah has accepted our call. 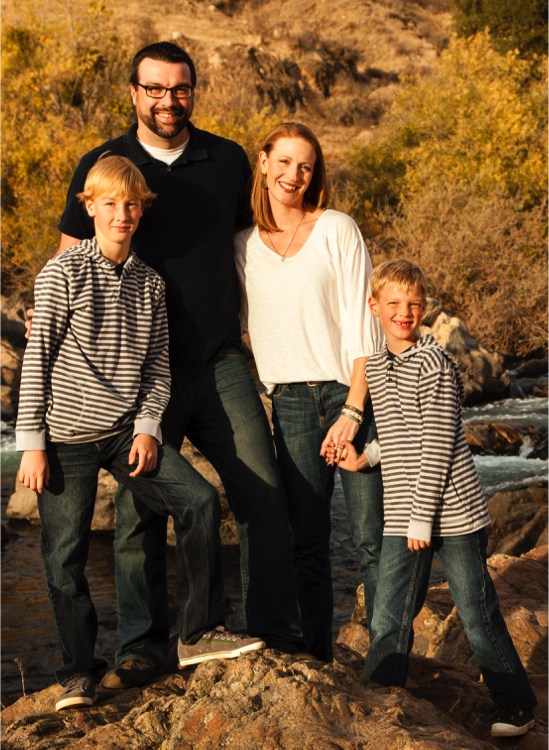 Jeremiah, his wife Amy, and their sons Micah and Titus will be joining us about August 1st. Sunday, May 24th: The search committee will introduce our candidate for lead pastor at this all-age worship service. Memorial Day, Monday, May 25th, 12:00: Join us for a BBQ on the patio at noon. You’ll have the opportunity to meet our lead pastor candidate and his family. The main course will be provided; please bring a side dish or salad to share. We’ll have a Q&A time with our candidate about 1:30. Sunday, May 31st: Our lead pastor candidate will be preaching this Sunday morning. Please join us for worship together. Friday, May 29th: Join us for a Bridal Shower for Tracy Roberts, 6:00 pm, CE Bldg. for a salad supper. Please call the office if you can help by bringing salad, bread or dessert. If you have or are willing to obtain any of these items, that’s great! They need to be in very good condition. Drop off the items at Community Covenant Church at “the porch of the log cabin” with a note “for Wings” or contact Jim (Willie) Young to make other arrangements. Club 4-5 meets at church Friday March 27th, from 7 – 8:30 pm. Bring your friends! Call Brian McCutchen if you have questions, 831-222-0576. The second session of the new member class will meet Saturday, March 28th, from 9 am – 12 pm in the Community Room. This Sunday, March 29th, at 10:30 am, will be an all age worship service. Youth Group meets Sunday evening, March 29th, from 7 – 8:30 pm, at church. Spring Break Youth Beach Day, Wednesday, April 1st, from 11 am to 2 pm! Meet at Its Beach (around the corner from Steamer’s Lane). Contact Brian if you have questions or need directions, 831-222-0576. Men’s Bible Study, Wednesday, April 1st, 6:30 pm, meet in the Library. ​If anyone wishes to participate in either service by doing a reading, please talk with Sally, 831-334-2302. Saturday, March 21, from 8 am to 12 pm is our Spring Cleaning Day. There are many indoor and outdoor tasks to tackle. Some examples are: cleaning floors & windows, cleaning/organizing the kitchen, removing stains from chairs, organizing the attic. Outside, the roof needs to be cleaned off and there is lots of gardening, weeding and trimming to be done. We would appreciate knowing who is coming so we can buy enough donuts and have cleaning supplies ready. Please let Scott know if you will be there Saturday. If a weekday works better for you, come for the afternoon of Wednesday, March 25th, from 2 pm to 5 pm. Sally will be here to continue working on the remaining tasks. If you can’t attend Saturday the 21st or Wednesday the 25th, please call Sally to coordinate a task and time to help. Sunday, March 22, after church, New Members Class kickoff meeting in the Community Room (next to kitchen). Sunday, March 8 – Daylight Saving Time – Spring FORWARD!! On Sunday, March 15, Abi Young and Scott Weiss will share the VOC (Vulnerable & Orphan Child) Program and Scott’s recent trip to Ethiopia after our 10:30 am worship service. Meet in the Community Room (next to the kitchen). On Sunday, March 22, we will kickoff a new members class after church. If you are interested in attending, please contact Scott or Sally. ​Thursday, February 26, 9:30 am, Men’s Group trip to Moffett Field Historical Society Museum. Meet at Surf City Coffee at 8:30 am, depart at 9:30 am. Contact Ed Hillman or Scott Weiss if you have questions. ​Sunday, March 1, after church, Annual Chili Cookoff and CHIC Silent Auction. Contact the church office if you’d like to enter your chili. Contact Brian McCutchen if you have questions about the Silent Auction. Saturday, February 14, 5-8 pm, Valentine’s Day Date Night, CE Bldg. Parents, drop off your kids ages K-5th grade at church to spend a fun night with the teenagers attending CHIC (Brian & Caroline supervising). This event is free – donations will be collected to help offset CHIC costs. Got a prayer to spare? If you recently took a prayer heart from the display in the narthex, please remember to bring a short, encouraging note to church on Sunday, February 15 for the young person you prayed for. Slip the note back into the string heart for them to find or give to them directly. Thank you to all who participated! The kids are sure to be delighted by your kindness. Thursday, February 26, a group of men from our church are going to visit the Moffett Field Historical Society Museum in Mountain View. They’re meeting at 8:30 am for coffee at Surf City and will leave for Moffett Field at 9:30 am. Contact Ed Hillman if you are interested. Sunday, March 1, The Chili Cookoff will be here before you know it. This year we are having a Silent Auction with proceeds benefiting our youth going to CHIC (Covenant High in Christ) this summer. Look for details in the bulletin on Sunday and consider entering your chili in the cookoff or just coming to the cookoff and the auction. If you have something to donate for the auction, please contact Brian McCutchen at brian.mccutchen@ccsv.org. Saturday, February 14, 5-8 pm,​ Valentine’s Day Date Night, CE Bldg. Parents, drop off your kids ages K-5th grade at church to spend a fun night with the teenagers attending CHIC (Brian & Caroline supervising). This event is free – donations will be collected to help offset CHIC costs. Soup Groups are this weekend (February 6-8). If you have signed up for a soup group, you should have heard from either Sally or your hosts for information on the date and time of your soup group. If you have signed up and have not heard from anyone, please contact Sally. Got a prayer to spare? On Sunday morning, take time to choose a heart from the poster in the narthex and pray for the young person named on the heart during the week leading to Valentine’s Day. Then, bring a short, encouraging note to church on Sunday, February 15 for that young person.